Yahoo! has launched Yahoo local area Information search Feature for Indian users too. The local information search that was earlier launched for the US has now been made available to Indian users. So if you need to know about the local info on any of the listed Cities you can make use of Yahoo Local Search Beta. The local is purely based on four major Cities - Delhi, Bangalore, Mumbai and Chennai ,with Bangalore being the default City.So you can change the city and search for what you need. 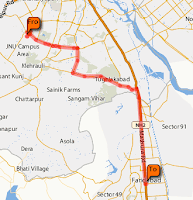 The search has an Immense info on Delhi and the surrounding NCR (National Capital Region). Using this you can search for almost any info in these regions like Shopping, entertainment, travel, Food and likewise. You can also get an info about upcoming events , latest movies and can also write in comments about various Places and joints among the cities. Yahool Local Beta combines yellow pages with the power of yahoo maps. So in local search I tried finding the way from 'Munirka, New Delhi' to 'Faridabad' , and it came up with fairly decent route for the same, which I think is not such an effective feature (Get Directions) in Google Maps. So in this area Yahoo! Maps fair well and good. This local area information search feature provided by Yahoo! is going to face stiff competition from others as well as almost every biggie is trying to capitalize on the growing potential India offers. Moreover Yahoo! Maps is also offered in Hindi too. Click on the 'Vernacular/Hindi' link on the maps to do the same. So now if you wish to try out this new feature, you may Go to Yahoo! Local India.